Mrs Kay's unruly Progress Class is unleashed from the classroom for the day to pile into a bus for a one-off school trip to Alton Towers until grumpy Mr Briggs gets on board and decides Conway Castle is a more suitable venue; trouble ensues as the kids boisterously rampage through a Zoo, a roadside cafe until little Amy Chandler goes missing at the beach. This hilarious and heart-warming tale, based on an incident in Willy Russell's life, from the multi award-winning author of Educating Rita and Blood Brothers sees a talented young cast singing and dancing rings around their fraught teachers. A joyous celebration of the trials and tribulations of growing up. 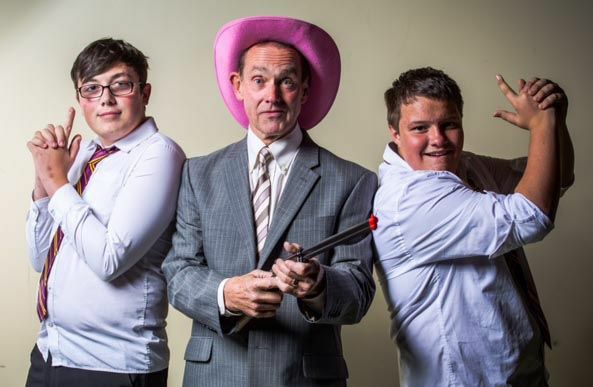 The grumpy deputy headteacher is no less than Cameron Smith, pictured here wearing a less thyan grumpy pink hat. The play runs this week Wednesday to Saturday (16th - 19th November)7.30 pm with a Saturday matinee at 2.30pm.